Don Milne here once again for the fifteenth day of travel along highway US-6. Yesterday, Roadtrip-'62 ™ traveled only 46 miles from Lakewood, Ohio to Huron, Ohio. We spent a lot of time on the beautiful shore of Lake Erie and of course we saw lots of history. Today we’ll travel even less. But as always, if you see anything you like on our travels, get yourself out on the road and enjoy it in person. A virtual roadtrip is fun but there's nothing like the real thing! At any time, click on an underlined word below to learn more about the places on the trip. Now, on to Cedar Point in Sandusky, Ohio! Today we’re going to do something a little different: we’re spending the entire day at one attraction. Cedar Point amusement park is our destination. Cedar Point is one of the few old-time parks that has made the transition to modern theme park and the start of that transition was just before 1962. Disneyland had opened in California in 1955 and some amusement park operators were quickly learning how to duplicate some of their success, just as hamburger restaurants had recently learned how to duplicate some of McDonald’s success. Cedar Point was begun in 1870 by local Sandusky businessperson Louis Zistel. He opened a beer garden, bathhouse and dance floor on the peninsula, bringing guests over by his steamboat ferry. The place became a popular location for sailing and swimming parties within a few years. Thrill rides at Cedar Point began in 1892 with the introduction of its first roller coaster, the Switchback Railway. While it was only 25 feet tall, this 10-mph ride would forever shape the future of the point. It’s long gone and about the only thing remaining from those early days is the Lake Erie beach itself; the reason the location became popular in the first place. The park we see today in 1962 looks familiar compared to the parks we might visit in 2013, but it is still in transition from small amusement park to modern theme park. Many of the rides are still generic and could be found anywhere in the country, such as the Tilt-A-Whirl, Scrambler, or Dodgem. But the newer rides reflected things happening at Disneyland. In 1960, Cedar Point opened a jungle “Dark Continent” boat ride and in 1961 the ”Western Cruise” Mississippi paddleboat ride on the adjacent lagoons, reminding visitors of rides in Disney’s Adventureland. Newspaper accounts of the time even referred to the changes as transforming the park into a “Disneyland” type park. To accomplish such changes, the park expanded from 40 acres to over 100 acres. Today, it has grown to 364 acres of fun. The park had been purchased by a Cleveland-based investors group in 1957 and the first thing they did was to open a new roadway out to the park. The new owners also engaged Marco Engineering, the same Los Angeles design company used by Disneyland, to redesign the entire amusement area. Other recent additions were the Cadillac Cars ride, opened in 1960, again much like Disneyland. In 1961, the Sky Wheel, a double Ferris wheel opened. One of the signature rides for decades, the Sky Ride, opened in 1962. This transported you overhead from one end of the park to the other. But we will miss several rides that I remember from my first visit to Cedar Point: the Cedar Point & Lake Erie Railroad and Mill Race, which both opened in 1963, and the Blue Streak coaster, built in 1964. Believe it or not, this park now known as “The Roller Coaster Capital of the World” had no coasters between 1951 and 1964! (Well, unless you count the Wild Mouse, but I don’t.) The previous wooden roller coaster, the Cyclone, was demolished due to poor condition in 1951. But the Blue Streak is a classic replacement with a traditional "out-and-back" ride from its 78-foot drop. The ride lasts one minute and 45 seconds, and travels up to 45 mph. While there were many older rides still in service during 1962, today only one that old is still in the park. The Midway Carousel was installed in 1946 and is Cedar Point's oldest ride. The type of rides you found here in 1962 were mostly the same rides you could find at large county fairs: kiddie rides, a Ferris wheel, a merry-go-round, a house of mirrors, and the previously mentioned Tilt-A-Whirl and Wild Mouse. When I was growing up at that time, we made a once-a-year trip to the Saginaw Fair in Saginaw County, Michigan. The rides came to us instead of us going to the rides; we never went to an amusement park. I first visited Cedar Point on my senior high school graduation trip in 1971. Most of the rides from that early 1960s expansion were already a decade old then, but what I saw was still partly a park from that time. Let’s buy our tickets and get inside. The current practice of one-price-ride-all-day was not yet common, and so we have a ticket book instead. It has different priced tickets for different rides, such as blue tickets, red tickets, etc. You had to be careful not to use up all of one price ticket too soon in case you found a ride that required one late in the day! This same system was in use at least into the mid-1970s, as I remember different tickets (Mickey, Donald, and so on) at Disneyworld in Florida. The only exception at Cedar Point was on Monday, probably the least visited day. Mondays got you into the park to ride anything all day long for just $2.65, or only $1.55 if you were 12 or under! Let’s take a look at the park brochure to see where to go first. First, even though the brochure shows the Cedar Point & Lake Erie Railroad, it didn’t open until the next year. So we won’t be taking that ride though we could have seen the Funway Station (originally Union Station) under construction in the center of the park, next to the engine house and yard. We walk into the park from the southeast end, where the picnic grounds were located next to the parking lot. The picnic area is gone now, replaced by more parking for more visitors. Once through the picnic grounds, you step onto the Funway, Cedar Point’s midway, which is where most of the rides are located in 1962. Rising over the Dodgem building are the new Sky Wheel and the Sky Ride. We’ll stay on the ground for awhile, using the Sky Ride later to come back here after walking the park all day. Let’s start with the Dodgem, a standard bumper cars ride. Next, the carousel is nearby and if you didn’t see enough carousels in New England when we were there, here’s another chance. This Daniel Mueller built carousel has 60 horses and chariots. You can also go around circles in the air, on the Super Satellite Jets. I’m a bit dizzy after those two, so lets look at the midway games. I never actually play these, because I have horrible aim and would never knock down enough targets to win anything. But it’s fun to see all the different ways they might take your money! At the Cedar Point of today, this would be a great time to try a roller coaster. But as there were none in 1962, I’ll get back up in the sky on the Monorail. Unlike the monorail at Disneyland or the 1962 Seattle World’s Fair, Cedar Point’s was not used for transportation: it was just a loop ride which only rose about nine feet off the ground. It was purchased used from Summit Beach Park in Akron, Ohio in 1959 and had only a short life here. It was removed for construction of the Blue Streak roller coaster by 1964. Time to take a drive on the Cadillac Cars or Turnpike rides. You had your choice of old style cars or modern versions, complete with big fins. Of course, the track kept you from driving anywhere interesting, but this type of ride is still popular here. These scaled-down replicas of 1910 Cadillacs still operate over a scenic quarter-mile ride. Next to this ride was the 1865 Miniature Train, but its last year of operation was 1961. As I mentioned, it will be replaced next year by the Cedar Point & Lake Erie Railroad, which was a full scale train bought from a sugar plantation. Across the Funway is the old Coliseum building. It’s full of arcade games. Of course, the games change as fads come and go. In 1962 we would not have seen any electronic or video games. Most of the games we would have found then are gone, but just a few years ago there were still a few pinball machines lurking in the back. The Cedar Point Ballroom was located on the second floor, where big bands performed in the 1930s through 1950s. Maybe something was playing here in 1962; I’ll check later tonight. Time for lunch after all that activity! Today there are chain restaurants throughout the park, such as Johnny Rockets, Subway, and T.G.I. Friday's. Back in our year, we had fewer choices but several new ones. 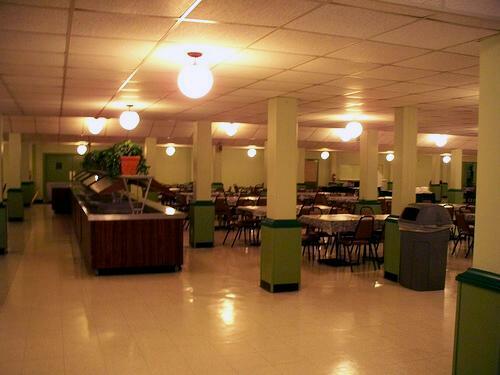 The Coral Dining Room, back near the Breakers Hotel, was remodeled with a new cafeteria in 1960. Likewise, the Chart Room was a new cocktail lounge at the marina pier that also opened in 1960. The Silver Dollar Café may have been here too, located near the Cadillac Cars. And there were also carnival food concessions in the park, like ice cream or Berardi's French Fries. We had some of their fries at Berardi’s Restaurant in Huron yesterday, but until 1978 they were located here, where they had been since 1942. They had to move out because the park eventually took over all private concessions. Strange how some things come full circle: the park is now full of private concessions in the form of chain restaurants. After lunch, we get back to the rides! But first, let’s start off with something easy, so lunch will stay with our stomachs. I’ve always loved miniature golf and here’s a chance to play a pretty new course. Cedar Classic Miniature Golf opened in 1961. It’s located right on the Funway. I like mini golf so much that I built myself a backyard version once, with modules that could be moved and recombined in different ways. After I refined the modules, I built a portable 9-hole course and ran a moderately successful business for several years, renting the course for company picnics, festivals, and other special events. The business worked well enough that I eventually had three courses in operation and sold it to another operator when I tired of running it. But today, I’m just playing the game like most of you. Right around the corner is Kiddieland, which opened in 1952. It’s comprised of the small rides like boats, cars, rockets, and such that go in circles, and a very small train around the area. Nothing here for me, as I came without a kid. A good choice instead is the Western Cruise, aboard a paddlewheel boat. This cruise around a circle in the lagoon features staged gunfights, burning buildings and other fantasy western scenes. This ride is also new! After we’re done, the Cedar Gulch Stage Line is nearby, where we can take a stagecoach ride with real horses pulling the stage. Then, it’s time to get twirled around some more after our rest. Both the Scrambler and Tiki Twirl opened in 1960 and both should spin us around a bunch. It’s finally time to try the brand new Sky Ride and save the walk back to the beginning of the park. This ride soars over 90 feet above the crowds for the half-mile from the frontier area back to the picnic grounds. Besides saving your feet, on clear days you get magnificent views of the park and Lake Erie. One great view is the extensive flower gardens right below the ride itself. You can also see all the other ride areas, the Hotel Breakers, campground, swimming beach, and maybe even see your car in the parking lot. Back at the beginning of the park, we can try the Rotor. The Rotor was an upright drum that you stood on the floor of. It spun with a centrifugal force equivalent to almost 3g. After it reached full speed, the floor was retracted and you ended up stuck to the side wall of the drum. When done, the Rotor slowed gently and you slid down the wall slowly. These were a fairly new ride, with the United States having only five in operation as fixed rides in 1956: Cedar Point’s debuted in 1961 and was removed after the 1964 season. Now we have to walk through the park again, to see the things we missed the first time! First up is the Fascination building. This is another carnival game of either skill or chance (depending on your point of view). It involved rolling balls up a sort of skeeball ramp, to have them drop into various holes. The holes would light up a display that looked like a bingo board, and you won a prize if you made a straight line. There was also a timing element so that you were actually competing against other players in the building. Each round began with the call "At the sound of the bell...roll ‘em. ", and a bell ringing. We could stroll out for a swim on the mile long beach, but we stopped at some Lake Erie beaches yesterday, so I’m going to skip that. At this time, there were no water parks or water flume rides to get you wet, though Cedar Point has both now. People either went swimming or just didn’t get wet at all. Well, I’m down at the far end of the Funway again, for a couple of last rides. First the Scamper, another new ride this year. Turns out I was wrong about the park having no coasters this year! The Scamper was a small wooden roller coaster with sharp turns like a Wild Mouse. Some sources say the Wild Mouse at Cedar Point closed in 1961, so this may have been a replacement. I did skip a ride though; the French Frolics. It was rather unusual in that you sat on stationary benches in a room that spun around you. It didn’t sound very interesting, which may be why it disappeared a couple of years later. My final ride of the day is the Dark Continent boat ride through the “jungle” along the lagoon. It features animatronic animals and scenes along the shores. The scenes allow the tour guides to engage in corny jokes. Speaking of jokes, one thing I don’t find in 1962 are stage shows. Apparently, these were not yet popular as the park didn’t open its Centennial Theatre until 1970. So we can’t watch the best of college student talent singing, dancing and telling corny jokes. When I first visited in 1971 there were several shows. The 70s corresponded with the heyday of television variety shows, where any singer could have their own show for a season or two. But even though there are no stage variety shows at Cedar Point in 1962, you could find high school marching bands performing along the Funway at times. There were also various spot performances in other places around the park. Time to go back to the car, so let’s take a final trip on the Sky Ride to get back to the parking lot. After that, I’m driving around the tip of Cedar Point to the Breakers Hotel to stay. The Breakers appears to have been the only hotel open within the park in 1962, though historically there were several others. The Breakers was opened in 1905 with the intention that there would be a view of Lake Erie from every one of its 600 rooms. About 90% did manage that, plus you can walk out of the hotel right onto the beach. You may not expect it, but back in 1962 black park patrons were excluded from the hotel. All major resorts of the period barred “negros”, as they were usually known at the time, not just resorts in the deep south. Even members of the big bands that played in the Coliseum could not stay at the Breakers Hotel. Fortunately, things have improved since then, as have the accommodations themselves. As part of the major park renovations the hotel was redecorated and had 100 rooms refurnished in 1959. A new cocktail lounge was also added on the beach veranda, new entrances, and new restaurant. In 1960 the improvements continued, with a newly renovated lobby and another 400 rooms are fully modernized. So we see virtually a new hotel in 1962! By the way, if you are taking a camping roadtrip, you were out of luck in 1962. Cedar Point’s Camper Village did not open until 1971. I’ll have dinner in the hotel restaurant as a bit of a changeup from my usual diner and fast food fare. Also, I checked at the hotel to see if anything is playing tonight at the Ballroom and there is! So I’m going to walk back into the park to see The Four Freshmen. Many acts appeared here in 1962, including something for the old timers, the Glenn Miller Orchestra. And after the show, let’s take a quick trip into Sandusky, Ohio for some great ice cream at Toft Dairy, Ohio’s oldest dairy. They have been around since 1900 and are usually open for ice cream well after Cedar Point closes for the day. In 1962, they had an old-time soda fountain in their Adams Street location. In 1985 they moved to a new facility on US-6 at the west side of town, and moved the original soda fountain and parlor seating out there. Of course, today they have another ice cream parlor right inside the park! That’s more than enough activity for one day, so it’s time for bed from “Cedar Point, Happiest Spot On The Lakes”. In 1962, 1,540,000 people visited the park with us. Cedar Point today is a success story, coming back from a small, run down park in the mid-1950s. It was helped when other parks closed, such as nearby Vermillion, Ohio’s Crystal Beach Park, which closed in 1962. However, it took a lot of money and vision to build what we saw in 1962, compared to just a few years earlier when the previous owners nearly demolished the place to build a housing development. And the company that owns the park and started here, Cedar Fair Entertainment Company, now owns thirteen amusement parks around the United States and Canada. In 2012, their Cedar Point was the most visited seasonal amusement park in the United States, having an estimated 3.22 million visitors! That’s over double the number that visited with us. They come for many things, but probably most of all because of its 16 roller coasters. I’m going to sleep now, but you can watch an 8mm home movie I found from 1961. The Baugh family shows many of the rides we took during our ROADTRIP-‘62 ™ day at the park. No smart phone video or VHS tapes: this is real, early 1960s technology!